End of the Line at the back of Peskett Canyon. Approach: Park at a creek leading up between the South side of Mt. Elliot and North side of Mt. Ernest Ross (AKA The Twins). Mt. 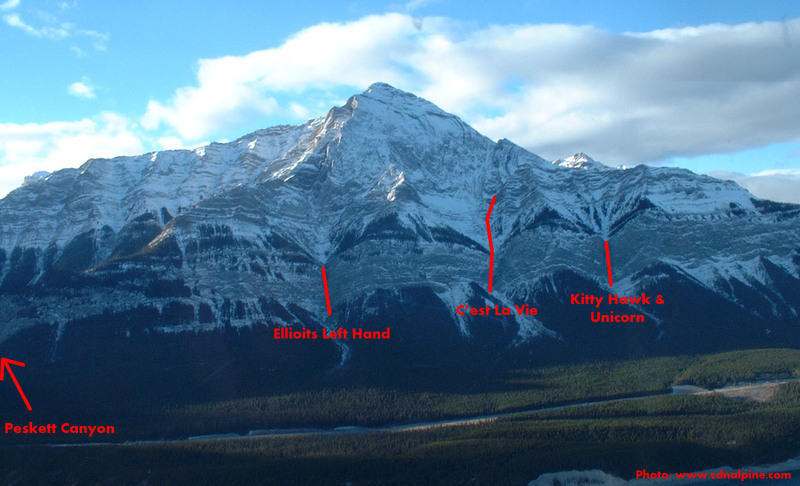 Elliot is the large peak beside Abraham Lake and has the ice climbs Kitty Hawk, Elliots Left Hand, and C’est La Vie on it. Hike up the creek or the top of the right hand bank for about 20 minutes to reach the canyon. Overview of routes on Mt. Elliot, including Peskett Canyon. Route Description: One of the most impressive slot canyons in the Rockies. It has also been called Elliot Canyon, Sentinal Canyon, BATUS Canyon, Box Canyon, and End of the Line Canyon. 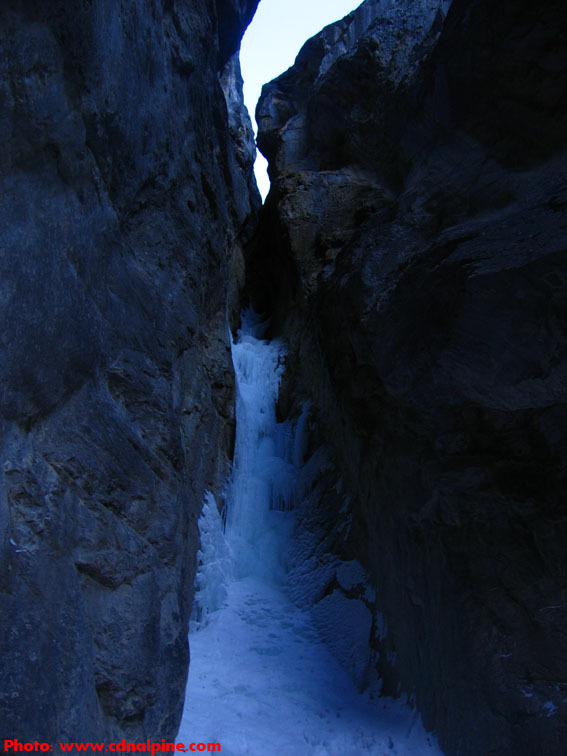 The canyon itself contains a number of short ice steps which are climbed to get to the routes. After a short ways, take the left hand fork and continue up the canyon to the climbs. End of the Line (WI4) is the climb in the slot at the very end of the canyon. 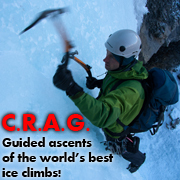 The ice on it can be variable in quality, but the climbing is always good. Above the first pitch, go a few meters around the corner to the hidden second pitch of easier climbing. 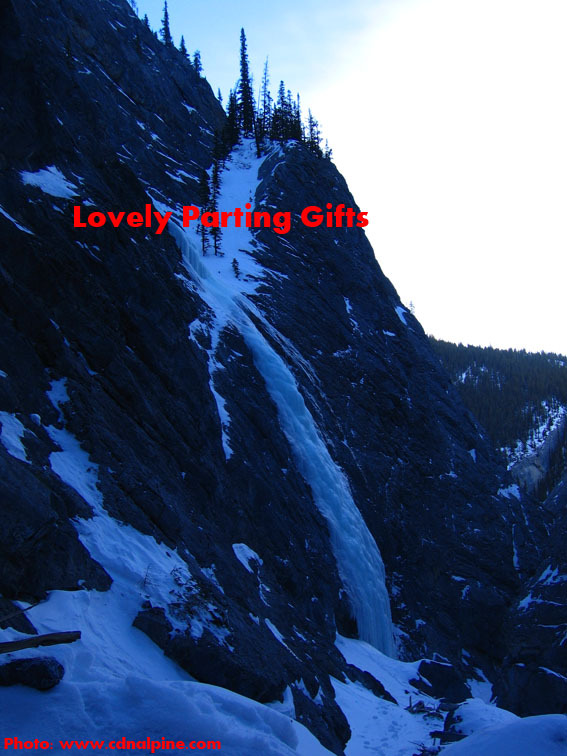 Lovely Parting Gifts (WI3) is the climb on the right hand wall just before the end of the canyon. Most people just climb the first 25 meters or so since it is low angle above. Lovely Parting Gifts as viewed from near the base of End of the Line. Descent: Rappel the routes and downclimb or rappel the canyon. Objective Hazards: Open pools of water abound early in the season and can be deep enough to create a serious hazard. Occasionally there is some rock fall hazard in various parts of the canyon.